ocean clean up | Educate.Empower. An emporium is a place where you can view a large variety of things. So the title ocean emporium is the perfect title to open children’s eyes to the abundance of amazing creatures that live within. With 24 different categories, each double page spread allows the reader to learn about the different animals that swim in our abundant waters. With stunning illustrations not only will the reader read the facts, they will also see the creature in all of its glory. We were amazed as we learnt about 8 different jellyfish and the way they all move, help each other and protect themselves. Dolphins leapt off the page at us and we were very impressed with the pink colours of the Chinese White Dolphin. Even coral had a mention – the truly amazing living thing that it is, and we learnt about the different latin names they have and ways that they grow. The Ocean Emporium by Susie Brooks and Dawn Cooper is a book to allow children to leap into non-fiction and really whet their appetite for deeper knowledge. The illustrations are full of colour and there is just enough information for young readers to enjoy without being overwhelmed. The Ocean Emporium is a wonderful journey to embark upon as you’ll discover secrets, learn new information and most importantly realise how important it is to take care of the world around us. Visit your local waterway and discover what swims beneath the surface. Go to local museums, aquariums and science spaces to learn more. Choose a creature or a group of creatures and learn more about them. Find out which of these animals live in the oceans near you. Are any of these animals endangered? What can we do to help them? Can you create an insect emporium? Monotreme? Mammal? Marsupial? Sky emporium? For the wild – links to great books and actions. A recent mapping exercise has outlined that only 13% of the world’s oceans are in true pristine condition. This means that only 13% can sufficiently support wildlife in all it’s forms – free of stressors such as plastics, shipping, overfishing, chemical pollution, run off, human activity and many more ways we change the world. We need to take action now and you can take action in some very easy steps. And check out these books to start some great conversations about water and the wonders it holds – so we don’t lose it! Octopus are very intelligent creatures and with eight legs and a bunch of friends they are also very good at cleaning up – even if the mess isn’t theirs! Anne Helen Donnelly has created another fun book with a much loved character – Ori the octopus and this time he has a little message for all of us! Meet Ori – a friendly Octopus who loves his underwater home, just not the rubbish that seems to be hanging around. Together with his friends they pile up the rubbish that is hanging around their watery houses but alas as the week goes by, the rubbish falls from the piles and scatters across the ocean again – encouraging them to problem solve a little bit more and work out where rubbish should go. Children will love the bright illustrations, the use of alliteration and repetition and the simple message of cleaning up after ourselves. Ori teaches us all that rubbish can not only go in the bin but also be recycled, reused, repurposed, composted or even better – refused! Ori also shows us that teamwork is one of the best ways we can make the world we live in a better place. So what else can you do with this picture book? – Explore alliteration of the animals names. What other names could these animals have? Can you think of names for other ocean animals? – Explore repetition throughout the book. What other actions do Ori and his friends do that could use this type of language? – Link all the different types of rubbish and where they go when we need to get rid of them. – Explore your own bin: What is inside your bin after one week of being at home? Introducing Global Guardian Project Junior: Exploring the Ocean. The junior issue of these informative online magazines is here, with a captivating first capsule – Exploring the ocean. What makes the Junior modules different? Information is still up to date and informative but not as fact heavy. Pictures and videos are still linked to each section as well as links to groups that help endangered animals or areas of the ocean. There are some great mini posters to download and colouring in pages to print out aimed at the 3-7 age group. There is a strong focus on craft and art – making the learning real as well as meditation more suited to little ones who can’t sit still for long! Great reading for parents is also included in these modules so it’s not just learning for the children, but also learning for the adults involved. Why subscribe to Exploring the Ocean and future issues? You’ll learn some wonderful new facts about animals who live in our oceans and how other families around the world are playing their part to ensure they are just as wonderful in 100 years time. We had a great time exploring this module! We had a great time creating our own ocean with a boat that was cleaning up plastic. This was all directed by my nearly four year old – it goes to show that a little bit of parent time, a little bit of information and a little bit of interaction goes a long way to empowering little ones to feel they can make a difference. Do love reading myths, legends and folk tales? Have you ever wondered how those tales came to be? 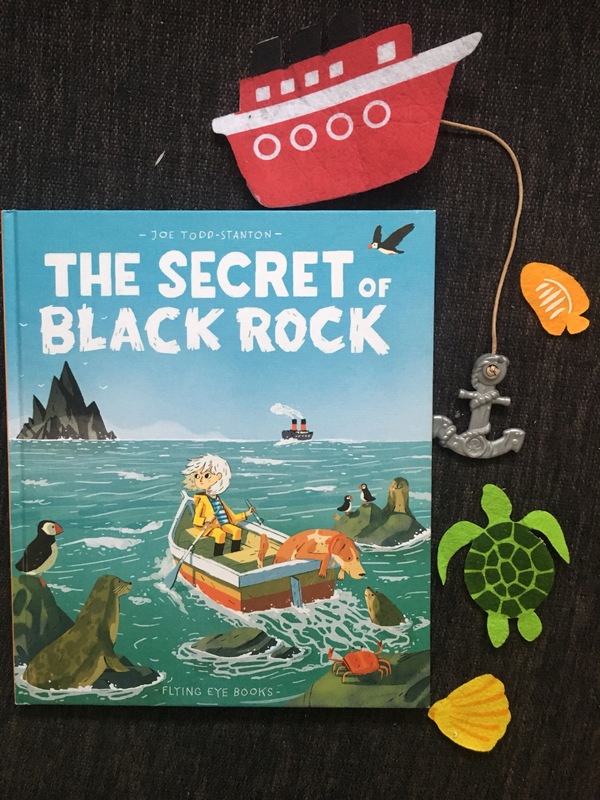 The secret of Black Rock by Joe Todd-Stanton is an adventurous folktale in which a young girl named Erin is on a mission to find out more about Black Rock. With determination, every day she attempts to stow away on her mother’s fishing boat, always getting sniffed out by her dog until the day she outsmarts him and sails off hidden aboard. As the boat sails on, a fog descends and through that Black Rock emerges. Erin, too busy staring at the towering rock doesn’t hold on tight enough and a wave knocks her overboard. She sinks deeper and deeper but she soon discovers that the Black Rock is in fact a living thing – and it saves her life. Erin then realises how alive with life Black Rock is and is determined to save it from being destroyed by the fishing village. Will Erin succeed in teaching the adults how important this rock is to their ocean? And how much they need this if they are to continue to fish for food and income? The illustrations are filled with colour and the detail in each page will encourage you to look deeper into each picture. The full page spreads enlighten and the circular images – give the reader different viewpoints on what is going on. The Secret of Black Rock is a tale which will make you think about those inanimate objects that you might think do nothing. Take the time to have a closer look and see what life, no matter how small, lives there and how it plays a role in the world around it. Explore life underwater. Take the time to note which animals are drawn into this story. Can you name them all? Which ones would you like to learn more about? Explore creatures that live on or around rocks in the ocean. Why do they all live here? Where else might these living things live? Have there been any incidences where rocks have been removed from the ocean and therefore affected the life that lives around or on it? How can we help others to become aware of smaller ocean plants and animals and the important role they play? Compare this story to graphic novels. How does this reflect the style of a graphic novel and how would this story be told differently if it were just a story? There are many adjectives in this story – find as many as you can. What is a folktale? Myth? Explore and share some. The beach is one of my favourite places to go to. The warm sand, the crashing of the waves and the smell of the ocean. I love swimming too – but only when it is warm enough! 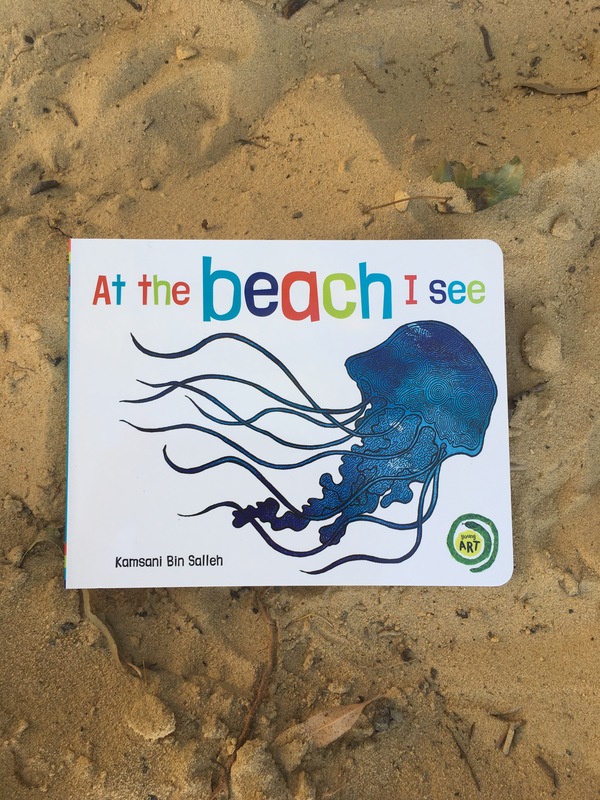 At the beach I see by Kamsani Bin Salleh and published by Magabala Books, is a vibrantly illustrated board book which young children will adore. 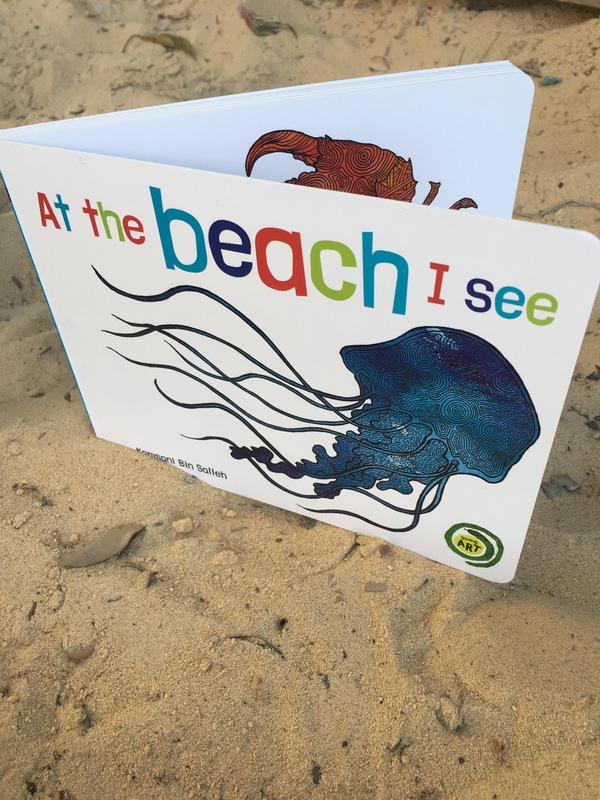 On each page the reader is treated to a visual delight – not only are the different animals or plants of the sea coloured in life-like colours, they also have intricate designs on them – which we loved looking at. The designs on each creature really highlighted the fact that although these underwater dwellers may look the same, they – like us, are all so very different. Each watery page also exposes the reader to creative adjectives that describe how the ocean animal or plant moves in or above the water. Babies, toddlers, preschoolers and even young school children will love reading this book. It is easy to read, alive with colour and full of amazing sea creatures! So what can you do with this book? Visit the beach, a river, dam – whatever local waterway you can and look at the different plants and animals that reside there. Take your sketchbook down and draw the animals. Look at how they live, what they might eat and where they hide. Explore the adjectives used in this book, how else can these animals and plants be described? Look at the patterns Kamsani Bin Salleh has used. Explore different types of lines – waves, circles, spots, straight lines, curvy lines, spirals, dashes, zig zags. Create your own art using these lines. A great way to do this is to cover paper in paint and then scratch lines into the paint – a great sensory experience. Look at some more great Young Art books published by Magabala Books. What do you love about the beach? 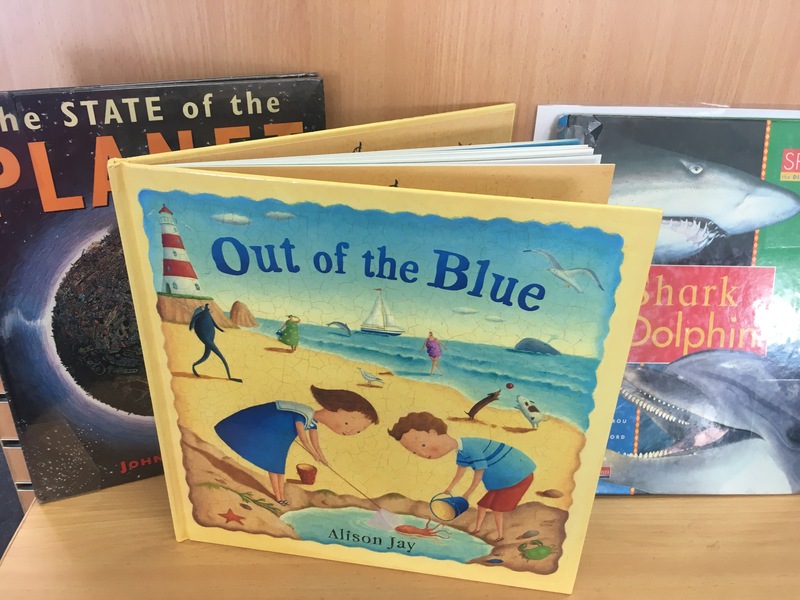 Out of the Blue by Alison Jay is a stunning wordless picture book which draws you into each image, searching for stories within stories. A young boy lives in a lighthouse and spends his days beach combing – where he meets a young girl and together they play until a storm rolls in. The boy retreats to his lighthouse home, to only find once awakening, that a giant octopus has emerged from the storm and is stranded on the beach – alive but tangled in old netting. The boy and girl rescue the octopus along with other caring beach goers and release it back into the sea to all of the other sea creatures. No words are needed for this story to make you feel warm with hope, blue with sadness and energised with joy. The illustrations allow your mind to wonder throughout the story and long after it has been read. Take your time to read this story again and again – and draw fact from the back pages to learn more about the creatures of the ocean and how we can take better care of them. The Ocean Clean up is an amazing company who are working on creating an eco friendly way to clean up the ocean by removing plastic bags that lie around in the ocean, harming wildlife and their habitat. Investigate organisations which act to look after the ocean. Should plastic bags be banned? Debate this – look at the pros and cons and work out why large companies are reluctant to ban them. Investigate ocean animals that live in the deeper parts of the ocean. What do they look like? How are their survival techniques different from animals who live on the upper levels of the ocean? Have there been occasions where a deep sea creature really has appeared on the beach out of the blue? Rewrite this story from the octopuses point of view or even the little girls point of view.